Both House Sparrows and European Starlings are birds that are NOT native to North America. Both species compete aggressively with our native Cavity Nesting Birds, like bluebirds, chickadees, and woodpeckers. Neither are protected species. They are exempt from the Migratory Bird Treaty Act (MBTA). Their nests, eggs, young, as well as the adults may be destroyed at any time. No permit is required to kill them. In contrast, all of our native birds are protected by the MBTA. 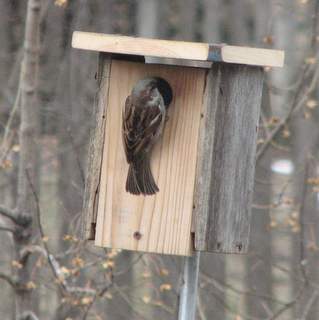 Both House Sparrows and Starlings are relentless in their defense of nest boxes they have chosen as their own. Left alone, they will force native birds from nest boxes, kill the adults and young, and destroy the eggs. If either of these species are trying to nest in your nest boxes, the only real solution is trapping them. There are single catch and multiple catch trapping devices that can be used to catch house sparrows and starlings. The Nest Box Trap is a single catch device that is placed in a birdhouse or Nest Box and captures birds alive. The birds enter the nestbox and set off the trap, catching them inside the box. There are also Baited Traps that catch the birds alive. Some catch multiple birds such as funnel traps and elevator traps. Others are single catch traps that use doors that close when the bird sets off the trap. With baited traps, the birds are captured when they enter the traps to eat the food. All of these traps catch the birds alive and unharmed. House Sparrow Control with Traps explains the different methods and devices used to trap sparrows. European Starling Control with Traps explains the different methods and devices used to trap starlings. The following links have more information on the destruction these birds have on our native cavity nesters. The Sialis website has examples of House Sparrows Attacks on our native birds. The Purple Martin Forum has accounts of a Starling Attacks on Woodpeckers. On occasion I have caught native birds in various traps. In nestbox traps, the most common bird that seems to get caught is the bluebird. One time, I caught a female bluebird four times in two days. Being caught didn't seem to bother her at all, as she kept getting caught. She stayed to nest as well. If you watch your set trap continually, you may even see a native bird enter it and get caught. In those cases, just open up the nest box and let them fly to freedom. Native birds I've caught in nest box traps include bluebirds, house/carolina wrens, and downy/flicker woodpeckers. Woodpeckers like to roost in nestboxes at night but will also explore them during the day. When using funnel traps and elevator traps, I've accidentally caught native sparrows such as American tree sparrows, dark-eyed juncos, and Harris's sparrows. I've also caught Carolina wrens. When you do capture a native bird, set it free. Once you have caught a house sparrow or a starling, the bird must be eliminated from the population by humanely killing it. This may sound harsh but remember, these birds are not native to North America and not part of our ecosystem. They are an invasive species. Our native birds have difficulty competing with them. They compete with our native birds, killing the adults, nestlings, and destroying their eggs. Releasing the sparrow or starling is not a solution. Do not release them somewhere else. This doesn't solve the problem but moves the problem it to a different location. Do not allow house sparrows or starlings to nest. Doing so causes death and destruction to our native birds. Their offspring will also compete and eliminate native cavity nesting birds. The following techniques are humane methods for killing these birds. Compress their chest cavity. Put the bird in the palm of your hand and wrap your fingers around the chest. Apply firm pressure for a full minute. This causes them to quit breathing and they will be lifeless in about a minute. Holding them in the bag they were captured in makes this easier to do. Once the bird is lifeless, leave put it in a bag for five minutes to make sure it is dead and didn't just pass out. I have had supposed dead birds regain consciousness. Break their neck. An easy and fail safe method is to pinch their neck with needle nose pliers. This will sever their spine and cause instant death. The bird is dead when the pliers sever the spine. After pinching their neck, the bird may still be moving. These are simply muscle reflexes. You may find this method easiest to do if you don't watch the bird after the spine has been severed. Gas them with carbon dioxide. The carbon dioxide can be purchased in canisters. Fill an air tight bag with carbon dioxide and the birds die from lack of oxygen. It takes 5 minutes for them to expire. If you cannot kill the birds yourself, there are places that can kill them for you. Veterinarians may euthanize the birds for you. Animal Rehab Centers may be able to use the live birds as food for their animals. Pet Stores that sell mice and rats as food may euthanize them for you. After the birds have been killed, its important to freeze them if you wish to donate them to a group that could benefit from them. There are many beneficial uses for the dead house sparrows and starlings. Give them to a Wildlife Rehab Center. They may have injured animals or birds of prey that would benefit from them. Use The Wildlife Rehabilitation Information Directory to find a wildlife rehab facility in your area. Donate them to science. Some of mine have gone to the Ornithology group at the Biodiversity Institute at the University of Kansas. Students use the birds to practice mounting specimens of birds. Feed them to Wildlife. Many wild animals will put them to good use for sustaining themselves and feeding their young. Bury them in the soil. Let soil organisms feed on them. This video shows a starling trying to evict a house sparrow from a nest box it had chosen. The hole of the nest box was too small for the starling to enter. I later trapped the male house sparrow.